When Todd's away, cookie making's at play! Todd is in a of couple of ultimate frisbee leagues and when he has practice...it's Katie-time in the kitchen! Some kind of sweet is always involved. Usually chocolate and always delicious. This episode involves cookies. Well, a kind of a cookie. These are adult cookies. They are cookies in a loose sense of the word. Kind of like a cross between a cookie and a chocolate-nut bar. There's not many combinations more delectable than hazelnut and chocolate, am I right? Also, these are sweetened only with dates and chocolate chips! No flour either! They are perfect as a breakfast treat or a snack after work. Begin by whisking together the ground flax seed and 1 Tbsp. water in a small bowl. Place in the fridge until ready for use. 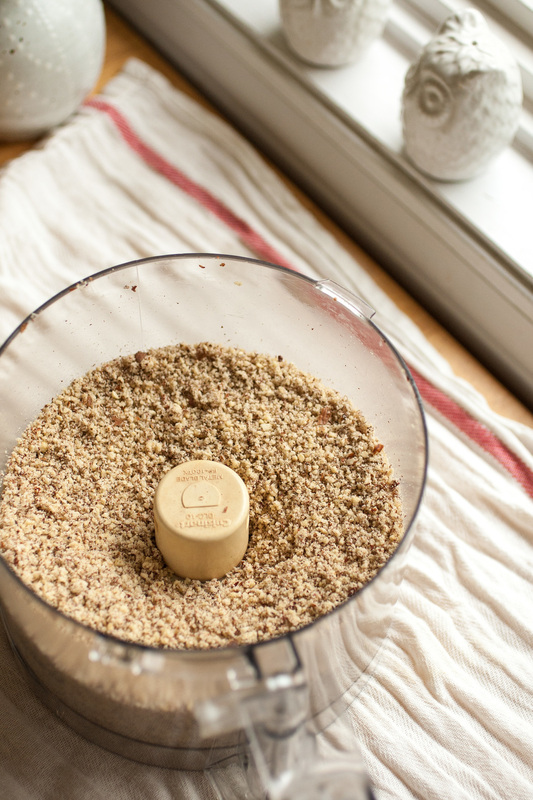 In a food processor, pulse the hazelnuts until finely ground. Just be sure not to turn into hazelnut butter! Transfer to a large bowl. Melt the butter in a small bowl in the microwave for about 30 seconds. Add the pitted dates to the processor and pulse with 1-2 Tbsp. water until it forms a smooth date paste. Process in the vanilla and butter. In the bowl with the hazelnut meal, add the remaining dry ingredients, excluding the vanilla and chocolate chips. Whisk to combine. Now add the flax egg and the butter/date mixture to the dry ingredients. Mix well to combine, then fold in the chocolate chips. Preheat oven to 350 F. Form dough into 12-14 cookies. Shape as you'd like them to be when done, because they won't change shape in the oven. Bake at 350 F for 10 minutes on a baking sheet. Remove from heat and allow to rest for a minute or two on the pan before transferring to a wire rack to cool. Store in an airtight container. Last weekend I did the Alaska Run For Women, which raises money for breast cancer research. Over 7000 women ran it! A family friend of ours had a mammographer running for her for too...it was me! Wishing all the women, men, and children affected by breast cancer peace and happiness in such a difficult time. Hazelnuts --> Haselnüsse (pronounced: hahzel-noose) - one of my favorite German words! "Under the current rules, a single slaughter line is allowed to kill a staggering 140 birds every single minute. That extremely fast rate causes workers to slam chickens and turkeys into shackles so quickly that the birds' leg bones often snap. Some birds are able to avoid the throat-cutting blades, which results in them being scalded alive in defeathering tanks." They are trying to raise the limit to 175. Do you want 175 chickens killed per minute? Me neither. Sign here.